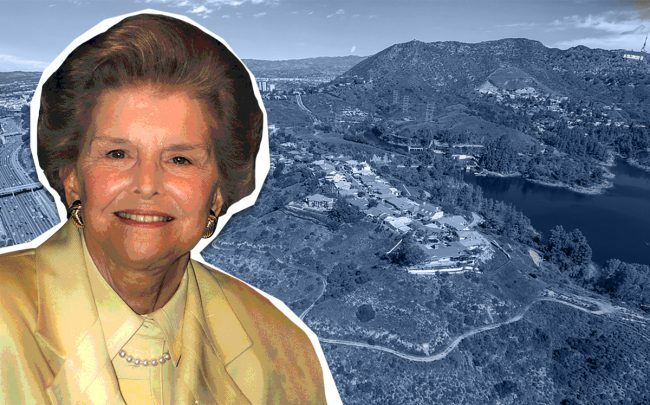 An 18-acre undeveloped property in the Hollywood Hills with ties to former First Lady Betty Ford, and whose current owner tried to zone it for a large residential building, is on the market. Listed for $30 million, the parcel was created by merging two separate properties, according to Forbes, which first reported the story. One parcel was owned by the former first lady, and the other by violinist Israel Baker. The location, at 2864 Cayuenga Boulevard East, is on a ridge between the Hollywood Reservoir and the 101 freeway, in the shadow of the Hollywood Sign. The current owner and now seller is Behzad Forat, a Studio City businessman. In 2015, he revealed plans to build a 250-unit residential complex on the land, and requested a zoning change with the city of Los Angeles to do so. The plans called for the units to be spread between two buildings. Forat had been in talks with former Los Angeles City Councilman Tom LaBonge for a zoning change in exchange for a donation of some of the land to the city for public use, according to the Hollywood Hills West Neighborhood Council. Now, it is being marketed as a mansion, including for a spec home developer. Neither would be out of character in the Hollywood Hills, which has seen an increase in spec home constructions.